An aerial view of SR 826/Palmetto Expressway. The Florida Department of Transportation's (FDOT) $262 million (estimated) design-build SR 826/Palmetto Expressway project will be completed in late fall as crews from the joint venture of Community Asphalt Corporation, Condotte America, De Moya Group Inc. are taking care of the remaining benchmarks of the initiative that began on March 31, 2014. The express lanes are expected to be opened to traffic in early 2019. The work is a joint-venture of FDOT's District Six (Miami-Dade County) and District Four (Broward County) to implement express lanes along 28 mi. of highway. The Palmetto Express project is adding variable tolled express lanes along the SR 826/Palmetto Expressway from West Flagler Street to NW 154 Street and along I-75 from the Palmetto Expressway to NW 170 Street in Miami-Dade County. The project is approximately 13 mi. 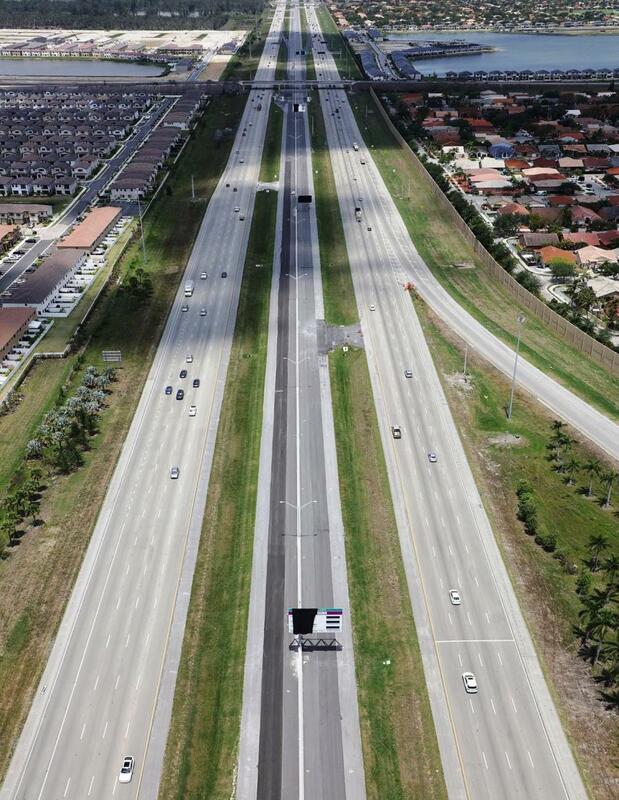 in length and provides continuity to the recently opened I-75 Express Lanes (75 Express) by FDOT District Four, from NW 170 Street in Miami-Dade County to I-595 in Broward County. The purpose of the project as envisioned in the emerging South Florida Express Lanes Network, according to FDOT on the project's website, is to provide users with travel options, offer more predictable travel time, deliver a long-term solution to manage traffic demand, and improve regional travel by providing highway-to-highway connection in South Florida. 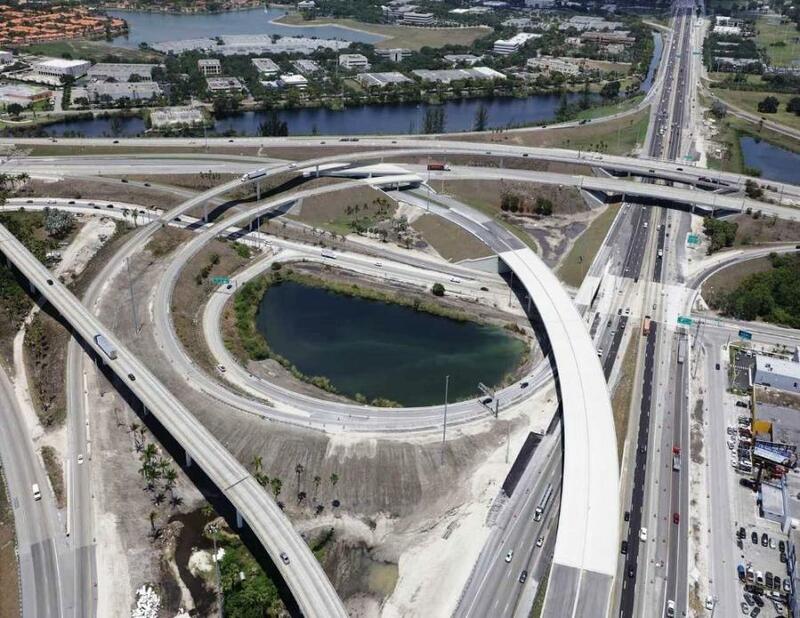 The project will help accommodate future growth and development in the region, and improve system connectivity between key limited access facilities in South Florida: SR 826/Palmetto Expressway, I-75, SR 924/Gratigny Parkway, Florida's Turnpike, I-595 and SR 869/Sawgrass Expressway. Both districts managed the procurement, design and construction of the six project segments, with District Six responsible for the I-75/Palmetto Express Lanes Project (Palmetto Express) that is extending approximately 10 miles along the Palmetto Expressway from West Flagler Street to NW 154 Street, and approximately 3 miles along I-75 from the Palmetto Expressway to NW 170 Street. District Four is responsible for the five segments from I-595 south to NW 170 Street (15 mi.). 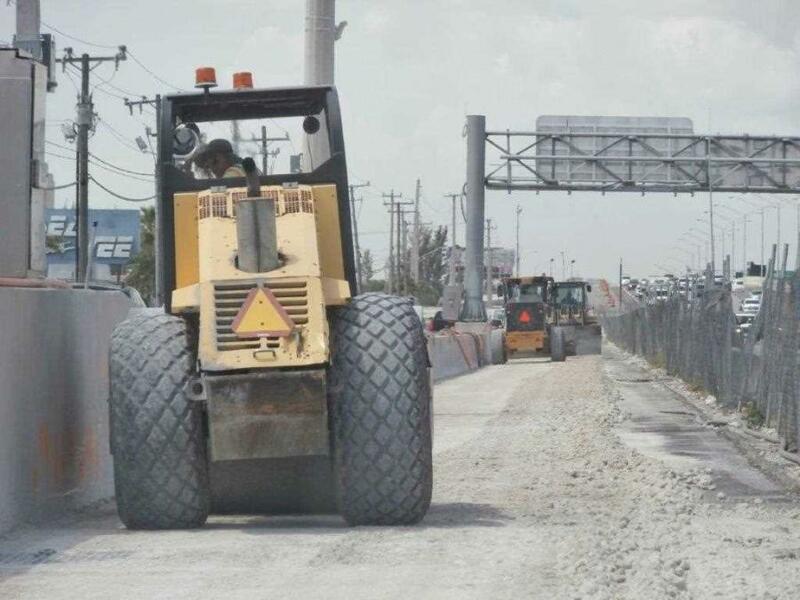 The work translates into the addition of one to two tolled express lanes in each direction along the Palmetto Expressway from West Flagler to NW 154 Street and one tolled express lane in each direction along I-75 from Palmetto Expressway to NW 170 Street. 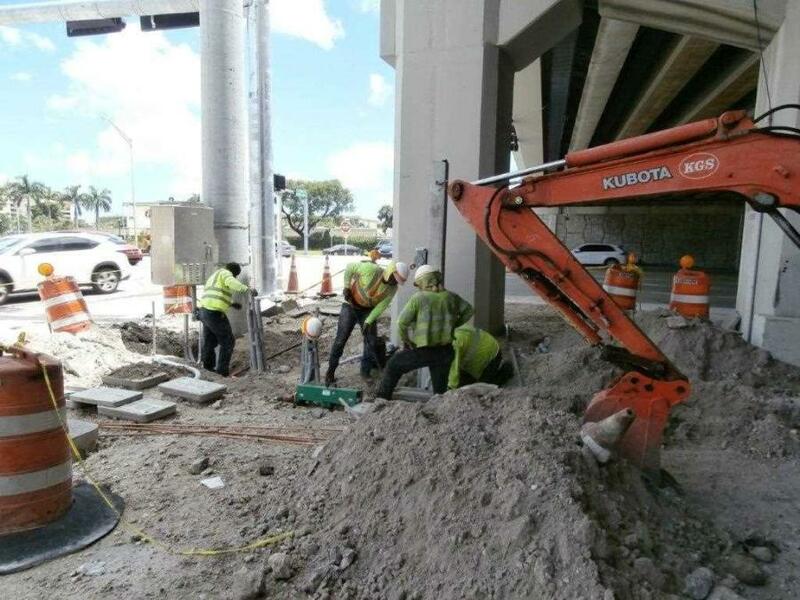 Other improvements include the construction of a new flyover connecting Palmetto Express and 75 Express and access points to/from the express lanes system; the installation of noise barrier walls at specific locations along I-75 and new lighting along 75 Express; ramp metering at entrance ramps from NW 25 Street to NW 154 Street along the Palmetto Expressway; and new landscape along I-75. The Palmetto Express Lanes will be located on the far-left side of the road and separated from the non-tolled general use lanes by express lanes markers. The 75 Express Lanes are located in the I-75 median and are separated from the non-tolled general use lanes by sodded areas or concrete barrier wall. Numerous access points have been placed along the highway to reduce congestion. 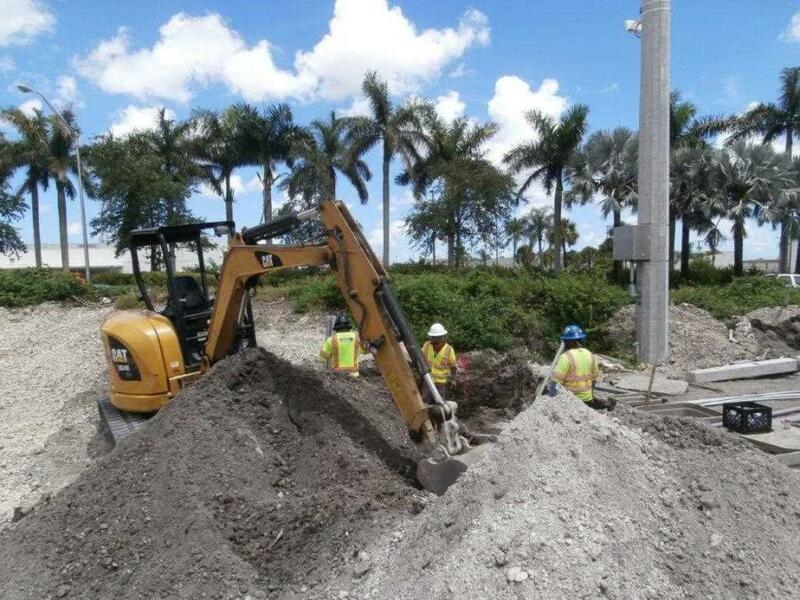 Ramp signals are being installed at entrance ramps along the Palmetto Expressway from NW 25 Street to NW 154 Street, and will be activated after express lanes open. FDOT has found that they reduce bottleneck congestion caused by unregulated traffic entering the highway. These signals will constantly monitor traffic flow on the Palmetto Expressway and allow one or two cars to enter at a time, according to the project's web page. In effect, forcing drivers to take turns and controlling the disruption caused by ramp traffic merging at the entrances. The current two-way average daily traffic on the Palmetto Expressway ranges between 209,100 to 223,000 vehicles per day and is expected to increase from between 344,000 to 404,000 vehicles per day by 2040, including the express lanes. The current average daily traffic on I-75 in Miami-Dade County ranges from 114,000 to 127,000 vehicles per day and is expected to increase to between 221,000 to 229,000 vehicles per day by 2040, including the express lanes. The success of 95 Express proved that the implementation of express lanes improves the traffic flow and benefits everyone in the highway, according to the web page. They provide an innovative, lower-cost alternative to traditional highway construction that offers a variety of options for managing congestion; and offer more reliable bus rapid transit service, separates long distance travel from short distance travel, thus reducing lane changes and opportunities for accidents. For the public transit component, FDOT is providing the infrastructure to Miami-Dade Transit and Broward County Transit to implement bus service on the I-75/Palmetto Express Lanes. A new Park-and-Ride lot on Miami Gardens Drive, west of I-75, is currently under construction. The estimated completion date is the winter of 2018/2019. FDOT has also noticed that express lanes enhance incident/accident management resources and traffic monitoring services, and leads to no restrictions based on the number of passengers in the vehicle as in the case of high occupancy vehicle lanes. Express lanes provide an innovative alternative to traditional highway construction with a variety of options for managing congestion, according to FDOT. As the work is winding down, so have the traffic impacts. The traffic management plan is based on various lane closures throughout the day and traffic shifts during non-peak hours to allow crews to work safely. The J.V. has completed 96 percent of the work. The remaining elements consist of adding express lanes within the I-75 median from SR 826/Palmetto Expressway to NW 170 Street and roadway widening along the east and west sides to accommodate the express lanes; widening bridges at various locations; the construction of permanent ramps at the SR 826/I-75 Interchange; milling and resurfacing of the Palmetto from NW 25 St to NW 154 Street; and the continuing installation of ITS devices. Traffic realignment at various locations is being done to provide room for widening operations.